Hello Crafty friends. I has been snowing again here in Northants and it’s very cold so I was happy to be cosy in the craft room making a lovely birthday card for one of my friends. I thought that I would share it with you all, but shh, don’t tell her, although I’m sure she won’t mind. I used the new AdvantEdge and the punch that comes as part of the starter kit. It’s really simple to make and very quick, so here goes. First choose the card colour that your recipient will like and chop part of the front off using a paper trimmer. Take some acetate and attach to the inside of the card so it takes the place of the card that you cut away. Trim away any excess. 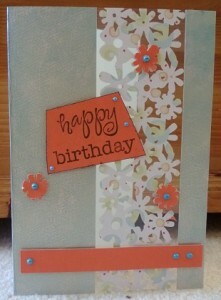 Using the Advantage and the floral punch, punch out the design using a patterned piece of paper or card. Attach this to the acetate. Then take piece of the card you cut away and stick it to the end of the acetate so it looks like your punched image is floating in the middle. 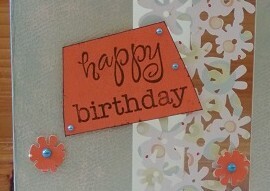 Attach a greeting and embellishments to the card to complete. As I say, this a very quick and easy card to make. You don’t have to use the same tools as I have, find what you have in your crafty tool box and just adapt it. Although, I will say that the AdvantEdge does have some really pretty punches. To stick the acetate I used Stix2 ultra clear tape, the type with the red backing, which, incidentally, is ultra-sticky too. Those are my tips, but what would you stick acetate with? Make sure you let me know. ** SHOW INFO ** I will be at the craft show in Harrogate this weekend, so If you happen to be going, come and say hello, I will be at the Art of Craft stand. Well, I hope you like the card I made and you have a go at making one too. This entry was tagged Birthday, Card Making, craft, Fiskars, Floating card, Great Northern Papercrafts Extravaganza, handmade, Interchangeable, papercraft, projects, stix2.